Kava is commonly known to be an aphrodisiac in the country of its origin and naturally supports relaxation and stress relief. * In our independent surveys, our Kava has been shown to help reduce anxiety and increase well-being, especially when used over a period of several months. Now you can enjoy your Kava in an easy-to-use Kava Tincture, with a 3% total Kavalactone concentration, and a delicate flavor that will not overwhelm. This organic full spectrum extract is crafted from the highest quality farmed or sustainably harvested Kava root in pure grain alcohol. Full spectrum extracts. Hand-crafted in small batches. Infused with pure passion. 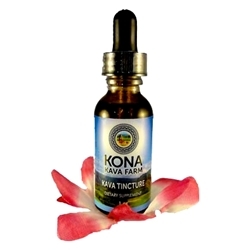 This is our Kava Tincture Plus, which boasts a 3% Kavalactone concentration; a concentration that’s just a little more delicate than other Kava tinctures on the market. Two dropperfuls and you will know, the moment your mouth starts to numb, that this is the quick and easy Kava infusion that you’ve been looking for. Directions: 2 dropperfuls twice daily. Daily dosage not to exceed 40mL (4 dropperfuls). Ingredients: Liquid extract of Kava root, at approximately 3% total concentration.